To create quality and standardized work through training, coaching and consulting. Our mission is to provide industry-leading technical training and expertise in Renewable Energy and Energy Efficacy to empower people, communities, and businesses worldwide and satisfy all the stake holders through hard work, Integrity and professionalism. Continuous energy crisis has crippled economy and made people jobless. Because of this energy crisis, use of Renewable energy is getting rise in Pakistan and Renewable Energy is the right option to generate electricity and reduce dependency on fossil fuels. 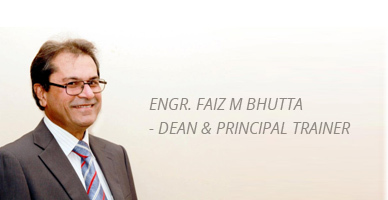 Faiz Muhammad Bhutta did his B.Sc engineering in Electrical from UET and MBA from IBA Punjab University. He has more than 30 years’ experience of working on various posts in the capacity of Service Engineer, Sr. Service Engineer, Assistant Manager Service and Sales, Business Development Manager, Sr. Marketing Manager and General Manager in Companies like ZELIN (PVT) LTD, Sopha Development France, Intech Process Automation, COMSATS HQ, HMA – GRUNDFOS and Izhar Energy. Apart from his professional career, he taught as visiting faculty for engineering and management subjects in UMT, CIIT, Air University and Pak – AIMS. He has delivered solar training in UET Taxila, Mehran University and Allama Iqbal Open University. He has got TOT training from RENAC Germany on Solar and got training from German master trainers from INTEGRATION Germany and Institute of Energy Technology Germany. He got various foreign trainings from companies like Bosch Germany, General Electric, Shubert and Salzer Germany, Trumpf Germany, Heiligenstaedt Germany, Nucletron Holland, Sopha France, RENAC Germany etc. He is member of organizations like REAP, PEC, IEP, IEEEP, HVACR, ASHRAE, ISES, MAP and PGBC etc. He contributed as member of task force PEC for development of Building Energy Code of Pakistan and Pakistan Electric and Telecommunication Safety code.